Thinking of starting your own salon? Before you jump into the deep end, get the deets on franchising in the nail industry. In the franchise model, a party (the franchisee) pays fees to a firm (the franchisor) for the right to conduct business under the firm’s name and sell the firm’s products and services. Franchisees must operate strictly by the franchisor’s “play book,” which covers everything from salon design to service procedures, ensuring consistency across all locations. It also ensures that the franchisee will fully realize the benefits of the franchisor’s research, lessons learned, experience and networks, as well as protects the brand’s reputation, according to David Crisalli, founder and CEO of Prose, which has two locations in Arizona. “A high-quality, well-operated franchise program presents a number of great benefits: a consistent service formula leading to a trusted experience for customers; an organized and rewarding work environment for the franchisee’s employees; enormous supply chain paybacks, as opposed to buying one polish at a time; and more locations conveniently located where customers live, work and play so as to meet demand more efficiently,” says Crisalli. What franchisees give up in freedom and flexibility, they gain in tools, systems and support. This is especially valuable in the startup phase. Franchisors will often ensure that franchisees have the necessary licenses and permits, assist with site selection, provide detailed construction drawings and lists of necessary equipment and supplies, set up technology systems, draft budgets and even develop a grand opening marketing plan. Franchisors also provide intensive business training that teaches the franchisee everything she needs to know about running the business. Once the salon is open, franchisors continue to add value through ongoing training and support, new product and service development, national marketing programs and more. As a service business, nail salon franchises tend to be more affordable to launch than franchises in other industries. “Our equipment, build-out and supply costs are significantly lower, for example, than the fitness or food service industries,” says Coffey. An initial franchise fee will secure a location, set a radius of exclusivity and provide all of the setup and planning benefits discussed above. However, a bulk of the initial investment is related to the site build-out. These costs include the lease and improvements; insurance; initial inventory; and furniture, fixtures and equipment (known as FF&E). When it comes to recurring costs, franchisees typically pay the franchisor a royalty (usually a percentage of sales). Additional ongoing costs vary by franchisor, but may include technology fees, special supply fees and/or a mandatory contribution to a national advertising fund. How much can a franchisee expect to make? Per Federal Trade Commission rules, franchisors can’t make direct earnings claims—for good reason. “Every situation is different,” says Fain. “It depends on so many things, like financing, whether the owner is drawing a salary, initial foot traffic or if the salon is fully staffed.” The time it takes to earn a profit is also situational. “We like to see franchisees break even by 6 to 12 months in operation,” says Coffey. Required Skills: Most franchisors look for franchisees with business and leadership experience first; being a licensed tech isn’t required. However, don’t be discouraged if you’re short on corporate know-how. The preferred franchisee skill set and training programs vary among franchisors. Opening a franchise with a business-savvy partner is also an option. Services Offered: Ensure that the franchise’s services align with what you love to do—and do best—says Coffey. If you’re passionate about organic ingredients, the franchisor should be, too. Likewise, if acrylics are your wheelhouse, you’re likely to be dissatisfied with a franchise that only offers natural nail services. Name Recognition: An established, recognized brand that delivers consistent service—no matter the location—doesn’t have to do a lot of proving in the marketplace. That could mean an instant clientele on day one. Coffey suggests looking online. How are guests talking about their experience? Is there buzz surrounding the brand? Market Adaptability: Because business is always evolving, it’s critical that the franchise has a plan to continually evolve every system, product and process to create better experiences, asserts Crisalli. “Great franchise systems are only as great as their ability to fail fast, learn, update systems efficiently and roll out those best practices quickly to all operators,” he says. Core Values: “At the end of the day, ask yourself if you feel comfortable with and enjoy the people who are part of the organization,” says Coffey. Do you value the same things? If you’re all about investing in a premium client experience, then you might not fit well with a company culture that strongly encourages cutting costs to impact the bottom line. See your future in a franchise? 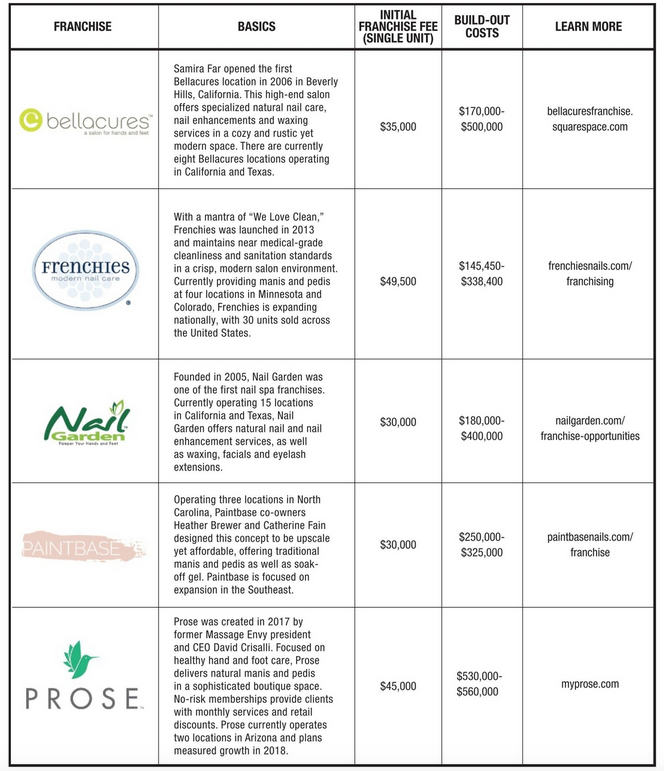 Check out what these nail salon franchises have to offer. What are your thoughts about opening a nail salon franchise? Let us know in the comments below! -Leslie Henry is a business development executive, licensed nail technician and the blogger behind workplaypolish.com.